The Retired players declare independence from the NFLPA. The history of how the NFL and NFLPA have treated the retired players is replete with cases of indifference and neglect. It was great players like Hall of Fame DE Carl Eller that built the league to the point that the players and owners were able to argue over 9.3 billion dollars in revenue. And yet most men that built the game are struggling economically. Even Hall of Fame players that retired before 1979 get just $ 200 per month from their pension. The pension is based on a percentage of what the player earned while active. Before 1979 most players were paid very little. Unlike Social Security, there was no adjustment for inflation in those pensions. As a result, they did not change despite the declining buying power of the dollar. To make the situation worse, virtually all of these men have lingering physical problems as a result of the injuries sustained by violence of the game. Just in the last few years the public has become aware of the mental issues resulting from multiple concussions, a very widespread problem with players that affect their entire lives. To make the situation worse, the process of claiming medical benefits has been made as difficult as possible. The red tape and length of the process has saved money at the expense of the people the fund was supposed to benefit. The NFLPA has claimed that they represent the retired players as well. But up to the most recent CBA, the needs of the retired players were all but ignored. Despite the multi-million dollar salaries that the current players get the plight of the retired players has gone unnoticed by most fans. In support of his fellow retirees Mr. Eller filed a suit against both the NFL and NFLPA to address the needs of those that built the league at the expense of their bodies. The efforts of Mr. Eller, AFL great Abner Haynes, Hall of Fame player and coach Mike Ditka and others directly led to the owners and union agreeing on an increase in the fund as part of the new CBA. 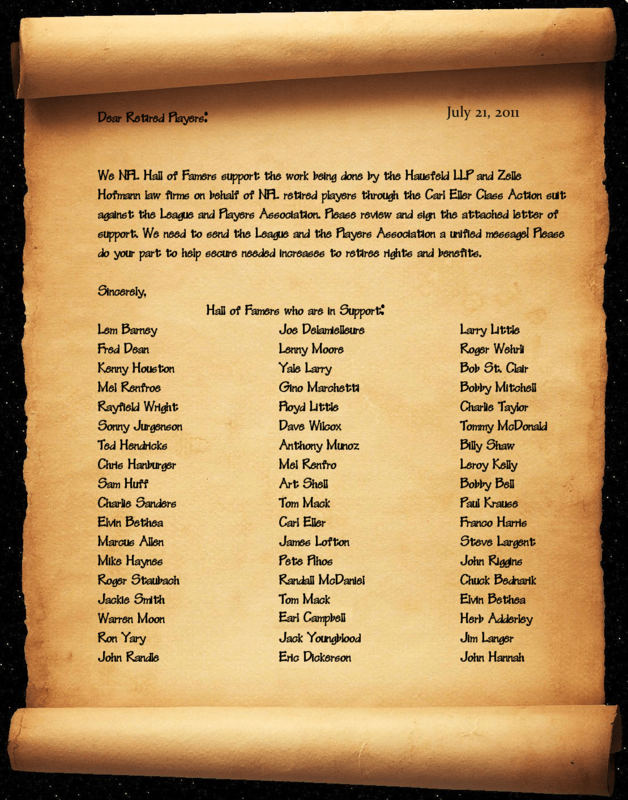 These groups of retired players are now asking to administer the fund. They have declared their independence from the NFLPA in the document copied below. Let the league and union know where you stand. These men gave their all for the game and the fans. It is time that the game gave them something back. Join us at 6-8 PM EDT M-F on https://fryingpansports.com/radio-show/ or http://mooheadradio.com/2.0/. On our last 7-9 PM EDT show we have Warren Shearing Exec. Editor of PROFOOTBALLZONE.com joins me at 7:20 to talk about free agency and what the 2011 NFL season looks like. At 8:20 Hall of Fame DE Carl Eller joins me to talk about the NFL CBA deal and how it impacts retired players. At 6:20 PM EDT Samantha Burton Indians beat writer for the Bleacher Report talks about potential trades, the injuries and the team’s chances for the second half of the season. At 7:20 I will replay the interview with Hall of Fame NFL DE Carl Eller. Mr. Eller will join us live soon to talk about the 1 billion dollars included in the proposed CBA and his meetings with the NFL and NFLPA on behalf of the retired players this week. Also please visit http://www.ipetitions.com/petition/nfl_retiree_rightsandbenefits/ and let the NFL and NFLPA know how you feel about the needs of the retired players. He is a senior writer for and edits https://fryingpansports.com. At 6:20 PM EDT Samantha Burton Indians beat writer for the Bleacher Report to talk me off the ledge about the Tribe’s fall and the team’s chances for the second half of the season. At 7:20 Paul Banks of Chicago Sports Guru and owner of the SportsBank.com joins me to talk about the NFL and NBA. Tomorrow at 6:15 PM EDT I am honored to have Hall of Fame NFL Star DE Carl Eller on the show. Mr. Eller led the Purple People Eater Defense to 4 Super Bowl appearances including #4, 8, 9 and 11. He is the lead plaintiff in the suit against the NFL and NFLPA on behalf of the retired players.